What is the SCOR Model and how to use it properly? In this article, we will explain the model, standard implementation roadmap, and implementation issues. 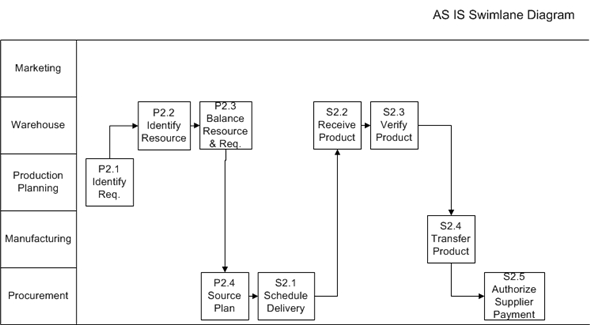 SCOR Model or Supply Chain Operation Reference Model was created by Supply Chain Council Inc (now part of APICS.) It was a non-profit organization founded by two Boston-based consulting firms: Pittiglio Rabin Todd and McGrath - PRTM (now acquired by PwC) and AMR Research - AMR (now acquired by Gartner) and many of their Fortune 100 clients. 1.1 Standard language: in the past, supply chain management is full of terminologies which are very hard to comprehend. Plan, Source, Make, Delivery and Return are the standard languages that almost all the people can understand. With its simplicity, it can gather more attention and help people from various disciplines to work on an implementation. 1.2 Standard roadmap: It provides a framework for supply chain improvement, from the development of an operational strategy to the implementation of new management practices. 1.3 Standard process: every supply chain improvement many involve the redesign of the business process. It takes a longer time to learn other process redesign methodologies. SCOR process mapping usually takes less than half a day to construct. Level 3 or the process decomposition is provided for reference. This is where you find it very easy because you don’t have to map the process by yourself. You just pick any level 2 process and you can get associated level 3 process. Level 4 may be drilled down from a level 3 process. Since each industry may have their specific processes which cannot be standardized, the implementation of these processes is optional, not provided. 1.4 Standard metrics: a good performance measurement should be realistic and understandable. Moreover, a measurement should be collected easily and represents the concern of the entire organization. 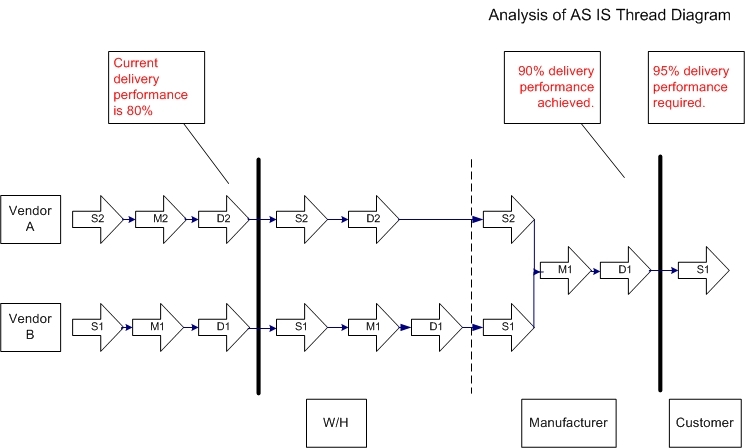 Standard supply chain metrics can ensure that every function and every player in the supply chain can interpret the result in the same way. Performance attributes are usually linked to a corporate strategy. Each of them consists of one or more measurements, also known as Level 1 metrics. Level 1 metrics may be branched out into the lower level or level 2 metrics for more control of particular processes. 1.5 Best practices provided: after the current performance is measured and processes are redesigned, the biggest thing we should contemplate is how to find a way to create an improvement. On many occasions, an improvement plan becomes unsuccessful. Cause of failure is mainly from the lack of understanding of root causes and best practices itself. Fortunately, the SCOR Model is equipped with plenty of best practices that associate with each process. Once a poor process can be identified, best practices will be on hands and ready to help fix problems. 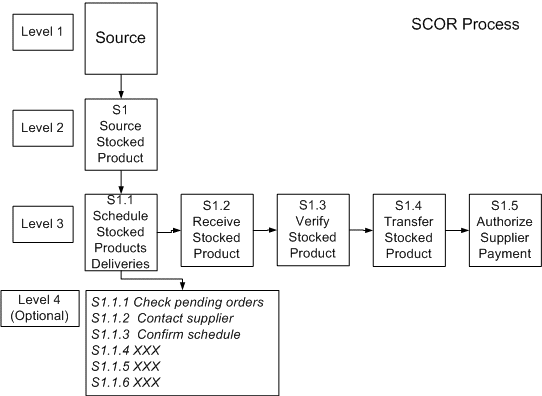 1.6 Cross-industry standard: many supply chain initiatives rely on the SCOR Model. Then, the process integration between trading partners in at the global scale is feasible. 2.1 Conduct SWAT analysis: in order to succeed in an implementation project, a thorough understanding of the current situation of the company needs to be investigated. This first milestone will lead us to the appropriate supply chain improvement plan. The most convenient method is to use the SWOT analysis. It typically reveals a problem from the human perspective. 2.2 Capture current performance: the company should examine how the supply chain is performing by capturing the performance data based on SCOR metrics. 2.3 Set performance target: after the performance is captured, a target performance should be set for each metric. The value of performance improvement should be calculated as shown below in simplified SCORCARD. 3.1 Understand material flow: following the first stage, the material flow will be captured and redesigned by showing the location of supply chain members on a map, including level 2 process, the result is the "AS IS" Geographic map. 3.2 Alter material flow: redesign material flow and make the "TO BE" Geographic Map. Possible issues to be considered in the material flow redesign include removal of non-value added facilities, relocation of distribution warehouses. In this example, value-added activities (M1) are included in its warehouse operations such as kitting. 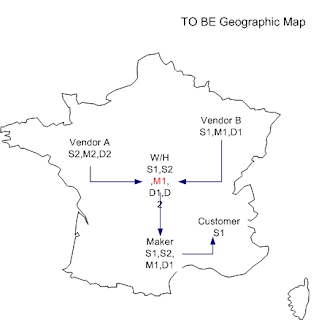 3.3 Understand inter-company process: convert "TO BE" Geographic Map into "AS IS" Thread Diagram which focuses on the inter-organization processes. Each level 2 process will be transformed into an arrow. Bold vertical line distinguishes the company entity. Dashed vertical lines indicate a different department in the same company. 3.4 Improve inter-company process: redesign the inter-organizational process by considering the issues such as the inconsistency of performance measurement between the trading partners. 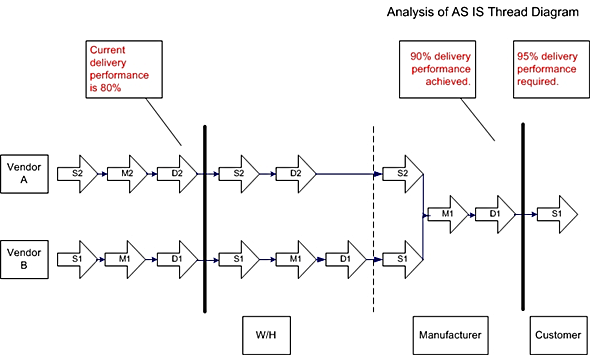 From the above diagram, a delivery performance of Vendor B who sells the make-to-stock product is 80%. In order to meet the end customer’s requirement, the warehouse may have to hold more inventory to protect a manufacturer against uncertainty. This type of metrics conflict should be resolved along the whole supply chain. To finalize "TO BE" Thread Diagram, the planning processes should be added. 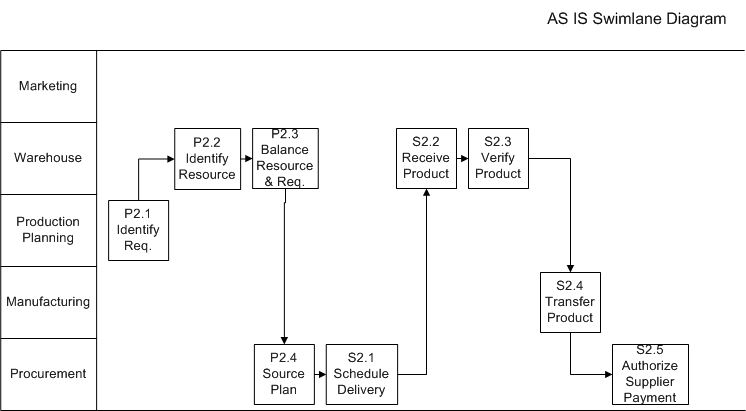 4.1 Map internal processes: it’s time to do a process mapping, level 3 processes should be drawn from the SCOR Model manual and translated into "AS IS" swim lane diagram. 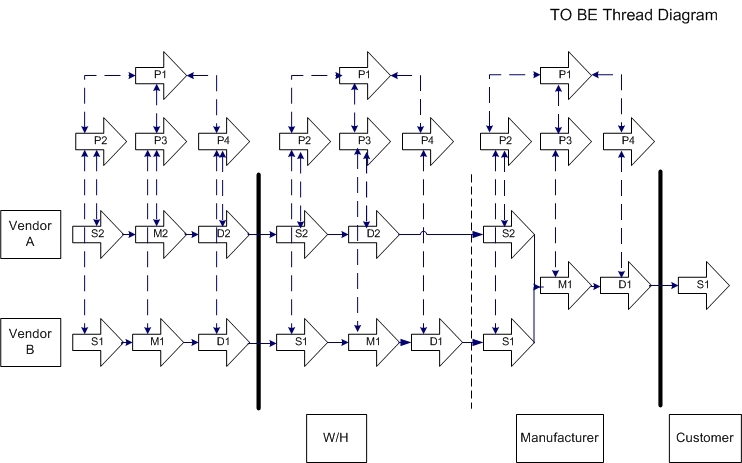 This diagram indicates each process under the function name. 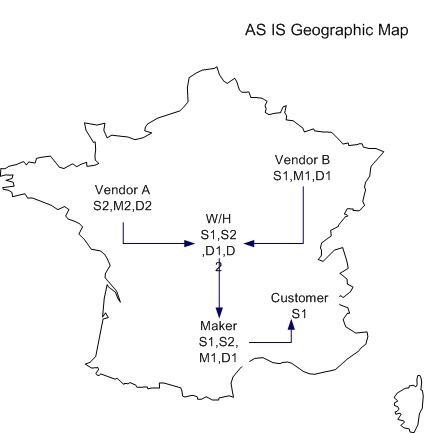 The example below illustrates the S2 process at Vendor A. 4.2 Improve the internal process: the redesign of the organization’s process should be done via a cross-functional team. Then, it’s recommended to gather the knowledgeable person representing each department. Brainstorming session from a design team indicates that the root cause of sourcing processes is the lack of coordination and information sharing. Then process redesign will create "TO BE" swim lane diagram. - To identify the product requirements appropriately, a production planning team works closely with a marketing team in demand planning phase. Moreover, a procurement team joins together with a marketing team and a production planning team to ensure that the products will be scheduled at the right time and right quantity inside a planning time fence. Many firms consider an improvement plan that requires no or minimum investment. In case it’s necessary to implement technology-related best practices, the value of gap analysis will serve as a guideline for an investment decision. 6.1 Fair human resource management system is a prerequisite for an implementation. The reason is that the SCOR Model needs a lot of input information from employees in order to analyze the business process properly. The troubled employee with problems about compensation, career opportunity, job satisfaction and stuff like that tends to be non-productive during a brainstorm/process redesign session. 6.2 To get more information from the end users quickly, you may develop a check sheet or a questionnaire based on the process of the SCOR. This will allow you to obtain data easier. 6.3 Existence of ERP system is not mandatory. However, you will find it difficult to retrieve the customer/supplier profile and cost data, if an acceptable level of accounting standard and record maintenance is not in place. 6.4 If the performance data based on SCOR metrics are not readily available, you may consider using a sampling method. Say randomly select 30 orders from the high-profit customers. Then, you can capture the delivery performance, perfect order fulfillment and order fulfillment lead-time. Cost of goods sold, asset turns, the cash-to-cash cycle time is available from a financial statement. 6.5 You don’t have to compare your performance against peer if your company is a small and medium business enterprise. Comparing a world-class company against a small company doesn't yield anything actionable. 6.6 Value from improvement is quite subjective, even though it’s calculated by a consulting firm. It should be seen as an indication if it’s worth it to pay the effort to improve performance in a certain area. 6.7 Most big companies use a simulation software in a project to make the improvement of material flow (configure supply chain). If the budget doesn't allow, you can just follow my guideline. 6.8 Metrics related to quality are not included. 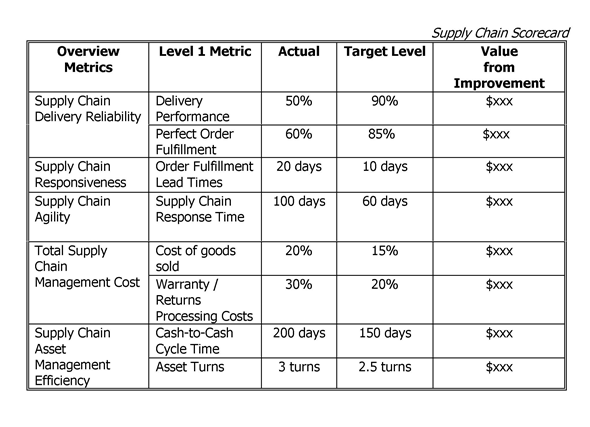 You may include it (or any other KPI) in a supply chain scorcard. Do you think this SCOR model guide is useful and why? - Bolstorff, P., & Rosenbaum, R. G. (2007). 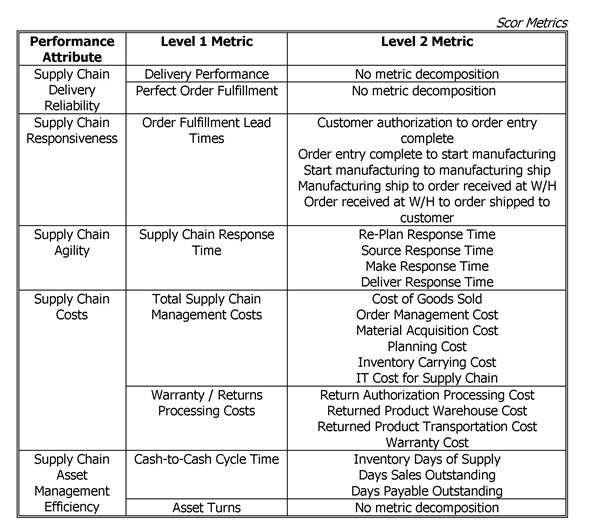 Supply chain excellence: a handbook for dramatic improvement using the SCOR model. AMACOM/American Management Association. - Goldratt, E. M., & Cox, J. (2016). The goal: a process of ongoing improvement. Routledge. - Jacka, J. M., & Keller, P. J. (2009). 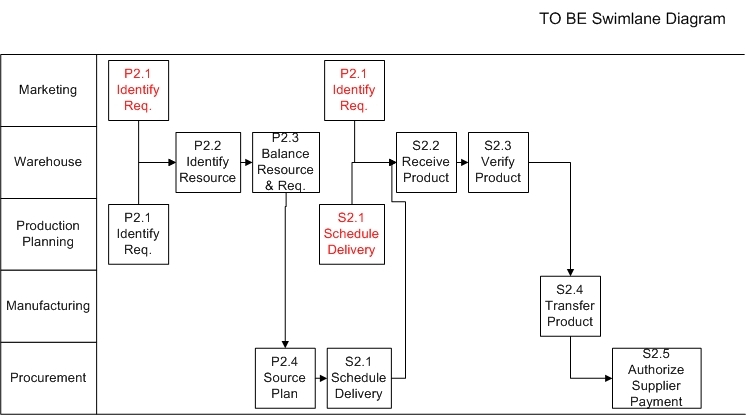 Business process mapping: improving customer satisfaction. John Wiley & Sons.